If your faucet drips constantly or leaks at its base, it could be a problem that stems from other more serious issues with your faucet, pipes, or plumbing. There are a number of different issues that can lead to this problems, including corroded pipes, defective gaskets, or mineral deposits, so repairing the problem is very important. Knowing how to fix a leaking faucet is just part of the battle for many Columbia, SC homeowners, though. If you ignore a dripping faucet, then a simple plumbing repair can quickly turn into a much larger and more expensive project, so you should contact a professional plumber as soon as possible for repairs. At Franklin Plumbing & Drain Cleaning, our experts will be able to accurately diagnose the problem before performing thorough repairs. Why Are Faucet Leak Repairs So Important? According to the Environmental Protection Agency, plumbing leaks can waste up to 10,000 gallons of water per household every year. Fixing a leaking or dripping faucet can easily save you up to 10% on your home's average water bill. Because dripping faucets waste such a significant amount of water, not repairing them can have a huge impact on the environment. Leaking faucets waste money and valuable resources. What's Making Your Faucet Drip? Loose Parts: Faucets are used very frequently, so over time, various mechanisms can become loose, which will cause leakage at the handle of the faucet. You may need to tighten these parts of your faucet, or they may need to replaced. Worn Out Seals: Disc faucets have inlet and outlet seals that are necessary to the way they function, and which can become worn over time with constant use and sediment build-­up. This could be causing your faucet to leak. Our plumbing repairs team recommends you have the water sediments cleaned regularly to make sure your faucet is functioning properly. You also may need to replace your seals to ensure the proper functioning of your faucet. Broken Plumbing: It's possible that a broken pipe, broken fitting, some other plumbing problem is causing your faucet to leak. For instance, cracked pipes can alter your plumbing system's water pressure, which in turn can create a leak. Contact our plumbers to have your plumbing system evaluated. 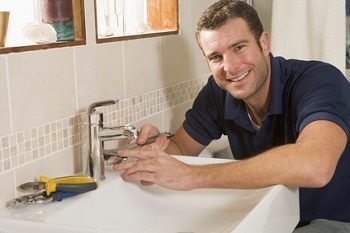 Do you need repairs for a leaking faucet in Columbia, SC? Call 803-799-2222 or complete our online request form.